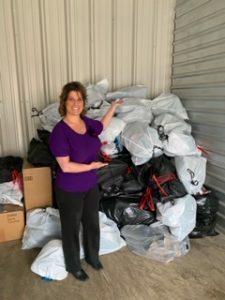 At GFWC West Virginia’s state convention in March, women from all over the state brought shoes for GFWC’s Cooperative Giving Project with Soles4Souls as part of the Seven Grand Initiatives. 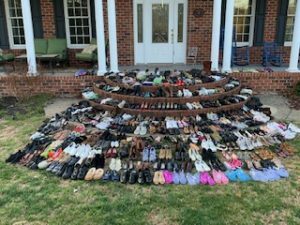 Over 650 shoes were collected! 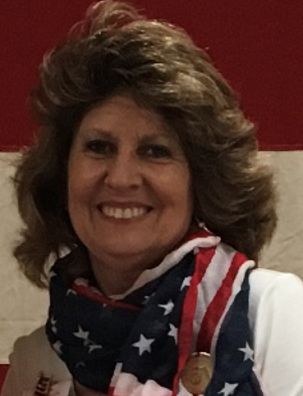 The GFWC West Virginia Director of Junior Clubs, Dana Richardson, spoke about Soles4Souls at a luncheon during the convention. She spoke about their mission and gave two accounts of real life stories. One was about an eight year old boy, Julio, who received a new pair of shoes to replace what was left of his boots, and one about Jounise, who was part of Soles4Souls’ micro-enterprise model. Jounise was able to open up a business and earn an income to provide food and shelter for her family. There were so many shoes that five clubwomen had to take several bags of shoes home with them because all of them couldn’t fit in one vehicle. Dana dropped off the shoes at a drop off location near her home. 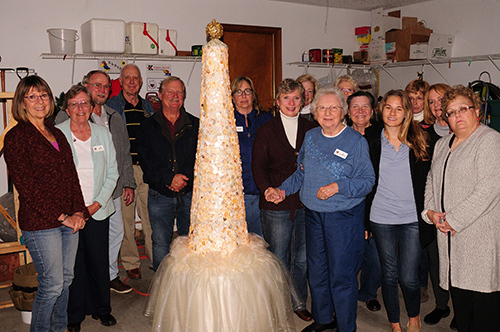 The GFWC Colorado Valleys District (Colorado), with a membership of 39 ladies, decided to do a joint service project as part of their Annual Spring Convention. The members brought personal care items for women and children. They stuffed purses they had donated full of these items to take to their local domestic violence shelter, Tu Casa. In 2018, Tu Casa served 226 survivors of domestic violence with support, counseling, and temporary protective housing as they continued on their journey of dealing with a destructive relationship and going on to a new life, free of fear and retaliation. In addition to this, in 2018, Tu Casa conducted 120 forensic interviews of children as survivors of domestic violence. Many survivors come to the shelter with only the clothes on their backs. 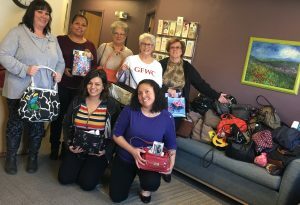 The GFWC Colorado Valleys District members thought that having a purse filled with the items with a note from the club member who filled the purse would be a bit of encouragement. The members filled 43 purses with a total in-kind value of over $800.00! The GFWC Progress Club of Las Cruces (New Mexico) distributed white awareness bracelets with a message to never condone domestic violence to three local high schools. February was Teen Dating Violence Awareness Month, so the club focused on that along with the Martin Luther King Day of Service in January. They had a former high school teacher make the connection with the schools and wrote a rationale behind the bracelets to create awareness and to gain buy in to distribute the bracelets. 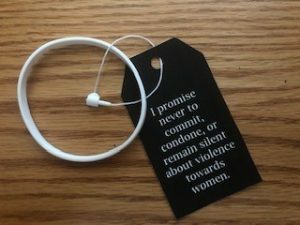 They distributed 500 of these bracelets which they purchased through their Domestic Violence Budget. These bracelets were readily received by the schools. Their Domestic Violence Budget is funded through three fundraisers they do each year: a Card Party, Fashion Show, and Golf Tournament. Their club also supports the local La Casa Shelter for Domestic Violence by volunteering and donating to their Christmas Bazaar, but this project was an opportunity to expand their support, as they know many teenagers have been exposed to domestic violence within their homes or in their community. 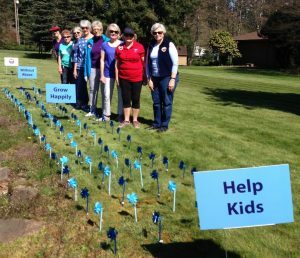 Nine members of GFWC-Battle Ground (Washington) planted a “pinwheel garden” to spread awareness of child abuse. In the midst of the garden are four “Burma Shave” type signs that all together read: “Help Kids…Grow Happily…Without Abuse…” followed by a sign with the GFWC logo. The west lawn of Prince of Peace Lutheran Church was chosen as the site of the garden because it is on a busy street and is the home of a preschool. Planting pinwheel gardens is a campaign by GFWC Partner Prevent Child Abuse America. The pinwheel symbolizes great childhoods. The display will be up through April, Child Abuse Prevention month. Gloria Walck, Wendy McDaniel, Valerie Huey, Nancy Lee and Johanna Hyatt. Photo by project chairman, Louise Tucker.